We have a winner for this book give away. Check below this first segment. Who does not enjoy pie? Just this past weekend, the Calgary Cousins reminded me that I needed to bake a blackberry pie, it's tradition. It's always enjoyable to take some of the old traditional recipes and make something that everyone loves. Today I'm going to share with you my blackberry filling. It's Flashback Friday and I'm bringing you back to my original pie recipe from the Mennonite Treasury. How many of you have this cookbook in your kitchens? Mine is so dirty, that it's almost an embarrassment but non the less, it works well and this recipe has fed many crowds. If you need a real tutorial, check out the first MGCC book, where Anneleise guides us through a step by step tutorial. Just wondering...is there someone here who has never tried making a pie? Leave a comment and your name because you may just be eligible for our MGCC cookbook giveaway. The lucky winner will receive her own cook book with a step-by-step pie making tutorial. Leave your comment and name so we can contact you. I will announce the winner on this same post in the following week. We have a winner....The names were listed, folded and drawn from a hat. Congratulations Selina! You are the lucky winner. Thanks for the wonderful recipes on this blog, I don't comment often but I do look at it every day and use the recipes sometimes. I have never made a successful pie. I once tried when I was about 14 years old, but it was not a success. I sometimes make mini pies in my muffin tin, but they are not the same. I would love a copy of this book, and would use it often!! Especially after a tutorial. Sift dry ingredients, flour salt and lard in a bowl. Using a pastry blender cut into flour until the size of large peas. Beat eggs in cup, add vinegar and fill cup with cold water. Slowly add this wet mixture to the loose crumbs and keep mixing. Remember you don't want to over beat this dough! The pastry is enough for about 3-4 /10inch pies, depending on how thick you make the crust. Mix sugar, flour and cinnamon together in a bowl. Add blackberries and coat well. Add this mixture into a pie crust and add the top pie crust. Make a few slits into the crust. Then lower heat to 325 degrees for 20 more minutes. I do not cover my edges with tin foil, as suggested in many recipes and I generally don't add egg whites. I prefer the edges and top crust to be well baked giving it a great flaky taste. Here is my original Apple Pie filling used from the Betty Crocker Book. Heat oven to 425 degrees, Prepare pastry as instructed above. Turn into pastry-lined pie pan. Cover with top crust and cut slits into the crust. Bake at 425 for 15 minutes and then reduce to 350 for 45 minutes. Apple Pie is a favorite at our home any time. Add a scoop of ice-cream and we've got mouths wanting more. Left over pie is perfect for any breakfast meal. Pies have replaced birthday cakes in our home. Somehow I never exceeded at baking cakes, so I resorted to making pies. I'm so happy to find this blog through Judy's blog! I love to cook, so I'll be checking in from time to time for recipes. Thanks so much everyone for sharing your special dishes. Marg. . my mouth is positively watering. Thank you for the recipe and yes my old treasury looked much as yours did . . good thing I was treated to a new copy from Charlotte and Betty. I so agree with your advice about using fresh apples. . .oh boy .. now my mouth is watering again. Thank you so much for the great recipe. Your pictures are great. Marg...I'm afraid my book looks worse than yours. It was a shower gift from my MIL back in 1971...yikes! And it has lots of notes in it...so I don't really care to part with it just yet. I use the pie crust on the Tenderflake lard box...almost identical to this. And I agree...tart apples are the best! Yellow transparent are one of our favorites. Airport Cafe makes great pies...but I'd rather come to your place anytime. Marg, that looks so good. I have NEVER attempted pie...pie crust looks daunting. Do you think I could manage? Sigh...I only just bought measuring spoons and as I told Betty tonight...I only have one measuring cup! Guess I need to get with the program now that I am venturing into the field of true baking and WITH experienced women such as yourself. Grin...don't get me wrong....I can turn out some mean food items...food items that is. More and more with all your expert advice and fail proof recipes I am becoming a success. And besides...everyone at work eats the 'mistakes' anyway. You are all making me very popular indeed. Perhaps I might even try PIE!!!!! Kari pointed out to me who you are! You were asking about hamburgers or something on one of the comments and I was wondering if you wre referring to Ketletten ...large deep fried meatballs. They were a regular on the Menu in days gone by. I'm so happy to hear that you have such warm fond memories of your mother. Even though our mothers' have passed on, they have left us a great legacy..Happy to hear that your grown girls have the new version. I come from a long line of pie and cookie bakers...cakes were never a big thing in our family except for angel food during strawberry season. I've had a busy summer and I need to "catch up" with you girls! I love flashback friday too. Thank you for the recipes....it was 2 for the price of one today! LOL! I'm50 and have never made a pie - only you great girls could make me admit that and not feel ashamed...I love that you offer to help people learn a new skill, rather than criticize or boast. Still more proof in the pudding (no pun intended! ;o) that actions speak louder than words. And you Ladies are living proof of putting God's words into action! Bless you! I have 'attempted' to make pie crusts a few times but loose patience quickly. They look like a kindergartner made them. Thank goodness the family loves my Social Apple Betty. Funny that you should comment about the birthday pie. Growing up our mother preferred to make pies and for our birthday we would get our own individual pie and didn't have to share with our 6 siblings. Let me tell you we savoured every bite of that birthday pie. Hello! I'm Cristina and I ran upon your website yesterday while looking on google for a "cheese buns" recipe. I love your blog...so many amazing recipes to choose from! When it comes to pies, I have to admit I never made one before. It always looked like a complicated thing to make. It would be neat to see a step-by-step tutorial on how to make one so I can pass it on to the ones I love. I am 57 years old and have never attempted to make a pie crust. I agree with previous postings, it is just too scary. I love a nice flaky crust, but it just seems to daunting. My husband makes a great pie crust as does my mother. Sad to say it is a skill that will be lost to the future generations. My mom made great pie crust and she passed that gene onto my sister. I, unfortunately didn't luck out in that department. I have tried to make pastry and it always ends up in a big mess in the garbage. I had a rare treat a couple of weeks ago. My sister came to visit and I asked her to make me some pastry. So I have 6 balls of pastry in the freezer for when I want to make a pie. You've got it made. But it might be a fun activity to do together. Cheers! Nope, I have never tried to make a pie unless you count refridgerated crusts from the grocery story. My favorite is blackberry and luckily, I have a best friend who loves to pick those and will make up a celebration to bake a blackberry pie and invite me over. But your recipes are so successful maybe I will try this. Thanks for all of them you share with us. I've never made a pie -- pastry scares me. I don't think I've ever even done the premade ones from the refrigerator section. Sadly, my mother passed when I was just 23, and my father and stepmother have no idea where any of her recipes are. Some of them were from my grandmother (who was a master (professional) chef/baker), and it breaks my heart. Aw here do you live Lynn? I would love to help you bake some pies!!! I can make the fillings okay and turn out a good pie but with prepared crusts, graham and otherwise. I want to learn how to do this better and quit second guessing myself with crusts. I learned how beat egg whites and do pizza crust that had stymied me in the past so there is hope! My Mennonite Treasury cookbook looks the same as yours - well worn! And I use the same pie crust recipe. I'm 51 and have never made my own pie crust. I cannot roll out cookie dough, so I figure, why try? I would love to win one of your cookbooks! I'm really enjoying your website, the recipes all look great! I did not know about your cookbook, we put in a big veggie garden this year and I'm scrambling for cooking and preserving recipes. I've done lots of baking but pie has never been on my list. My mom was the pie maker! Thanks for the chance to win! 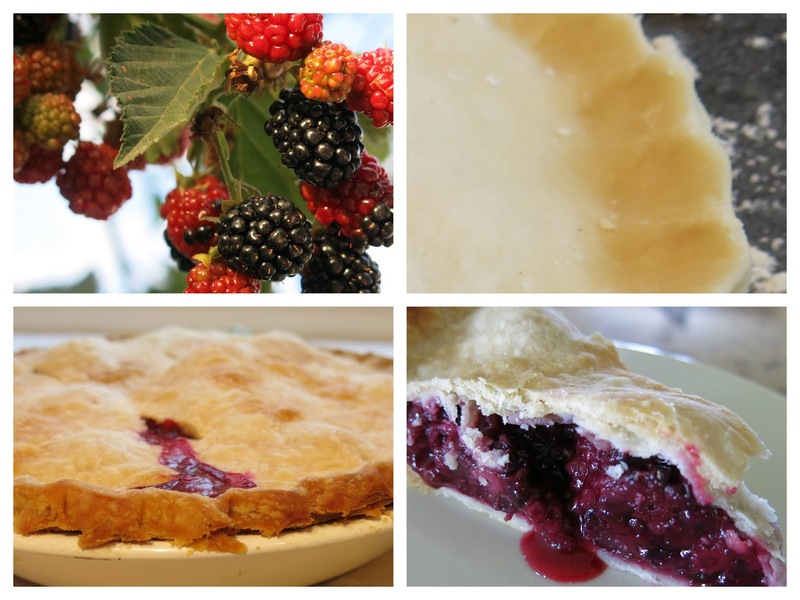 I have tried many times to make my own pie crust, especially for blackberry cobblers (my favorite)! I never get consistent results. I have tried multiple recipes and am never fully satisfied with the final product. Oh, it's edible, it's just not as wonderful as I'd like it to be. I would love to win one of your cookbooks!! Would love to win your cookbook. Thanks for the opportunity to enter. Your pie recipe is extremely similar to mine, though mine makes 5 crusts and we add 1 Tablespoon of sugar. Your must roll yours thicker. Plus some of my plates are 8 or 9 or 10 inch. I wish I could win, but I am already a very good pie baker. I hope your book will encourage someone else. So many folks are intimidated by pies...I wish they could see how rewarding a fresh beautiful pie is to serve to others. Yes, I do make mine a bit thicker than thinner. I prefer to taste the crust, instead of it being soggy in fruit. And I have a variety of pie plates also, so it all works in the big scheme, doesn't it? It's fun to help others see the reward of making their own pie. I have an old Edna Staebler cookbook that I absolutely adore and your pie crust is very similar to hers although she didn't put baking powder in it. Lard honestly makes the best, flakiest pie crust! With fall just around the corner, pies will be adorning my kitchen table soon! I too fall into the never made pie crust group. I have made a pie but not with my own pie crust. For some reason it scares me. It is on my list of things to accomplish. Your post reminded me that I need to do this. Thank you and enjoy following your blog. Never, give up...who am I to say that? I would love to make some heritage recipes, but they never taste as good as my grandmothers and she's long gone. Keep trying. Nice giveaway Marg. Would love to try out the recipes in this cookbook. I have only made all butter pie crusts. But I am encouraged with the comments regarding using lard. My next one I think I will be brave and try with 1/2 butter (for flavor) and 1/2 lard. I have a very hard time rolling out the crust so am wondering do you by chance have a recipe for a no roil crust I mean a pastry crust I can make the pastry but when it comes times to roll it out I am hopeless !!!!!! I could not find it available on Amazon. They are out of stock. Try some Christian bookstores. I have baked a pie before but I just bought some Granny Smith apples today and was looking for a good recipe. Thanks to you I found one. Thank you! It sure would be fun if we could gather all of those who have never tried making pie dough and have a hands on tutorial. We have had a pie making class at Lepp Farms. They are always well attended. Keep trying! As a NYer pie making was not something we did. I tried a few times I need help!! Cheesecake, yes. Fruit pie with homemade filling and homemade crust, definitely not, I'd love to come to beautiful B.C. and have one of you teach me. Been married 51 years and consider myself a good cook. The one thing I stay away from is making pies. I had a bad experience once with making the pastry . That part I never mastered and keeps me away from pie baking. If only it was easy! I have made pies but sadly from store bought crusts. Would love a well tried recipe and other cooking recipe treasures. My old and well splattered pie crust recipe is very similar to yours but without the baking powder. Making your own crust is so satisfying even if it's not as delicious as your own mom's was. I would like to learn how to do it with butter as well (for some of my friends who do not eat things made with lard). Apple pie is the favourite pie in our house and we always serve it with a nice slab of aged cheddar cheese! I've been in a pie making mood of late. Oh how wonderful it would be to sit in on a tutorial done by you amazing ladies! I am ashamed to say I am 61 years old and have never made a pie. I am from a Mennonite home and I bake everything else, but for some reason have never made pie crust. And, apple pie, is my husbands absolute favorite dessert! Isn't that a shame? I hope my comment will apear.....I posted yesterday, but don't see it anywhere....But i'd love to win a nice cookbook, the pie looks delicious! My husband and I picked blueberries yesterday, so i'm freezing some for a pie! Hi there. Nope I've never made a pie before. We had one class in Home Ec where we were to make a banana cream pie. Unfortunately I was away from school recovering from an illness and another opportunity didn't come up that year. My mom is not a pie maker either. She mostly made a marble style cake in little loaf pans or in a bundt style pan. She also made cookies Which she called Oma cookies. I need to ask her about those. I cant remember how long it's been since she's made them. Maybe my daughter and I need to try our hands at homemade pie for my mom's 80th birthday next month. Maybe some oma cookies too. Some old and some new.Thanks for the recipe and please include me in your draw. Blessings.